Why do dogs like to roll in smelly things? By Mary Jo Dilonardo, with interestingly-different opinions from Dr. Stanley Coren, Dr. Patricia McConnell, Dr. Alexandra Horowitz, and Dr. Marty Becker. Puppy play: why it matters by Sylvie Martin at Crosspaws. "They throw themselves on top of one another and on the floor, they paddle and punch with their paws, they hang off each other’s ears with their teeth, they chase and invite being chased, they bow, bowl and bounce all over the place. In short, they seem to be having a ball." Dr. Anne Fawcett on re-directed aggression in cats. "Last night I was the victim of an attack, from a household member." Why do most animal shelter workers burn out? By Dr. Hal Herzog. "Like other people who are “called” to a career, all the shelter workers in the study entered the field with a sense of deep moral, social, and personal commitment. But caring for animals can have its costs." Dubai goes to the dogs. Expats abandoning pets when they finish work placements. How this teen and his dog in Nova Scotia saved the life of an 89 year old man. Why the cats on one British island have lost their tails on Manx cats. See also International Cat Care on Manx cats and the problems this genetic defect causes. Giving a speech can by terrifying, but these dogs are here to help… Karin Brulliard on the “audience dogs” at the Kogod School of Business. Could Omar be the world’s longest cat? The mystery of the wasting house-cats on the rise of feline hyperthyroidism. But my dog isn’t food motivated. PPG webinar by Kathy Sdao Wednesday June 28th 2017. Feline foraging toys: How to implement, motivate, and stage the difficulty level by Ingrid Johnson for Pet Professional Guild. Weds 26th July 4pm EDT. In this short clip from a new BBC series, Dr. Carri Westgarth explains the signs to look for that mean a dog is anxious. 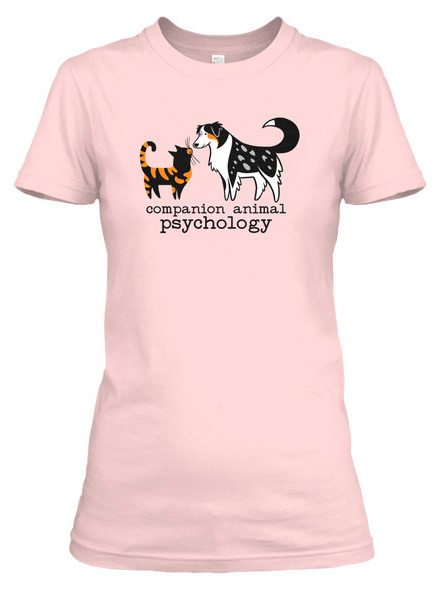 This month saw the launch of the Companion Animal Psychology t-shirt. Wearable art for animal lovers, it is available in various colours and styles. 100% of the proceeds go to the BC SPCA Maple Ridge. This is a cause that means a lot to me, and I thank you for your support. Let me know which colour you pick! The t-shirt shown above is the Gildan women's relaxed tee in pale pink. The month’s book for the Companion Animal Psychology Book Club is Dog Sense: How the New Science of Dog Behavior Can Make You A Better Friend to Your Pet by John Bradshaw (titled in Defence of Dogs in the UK and Australia). 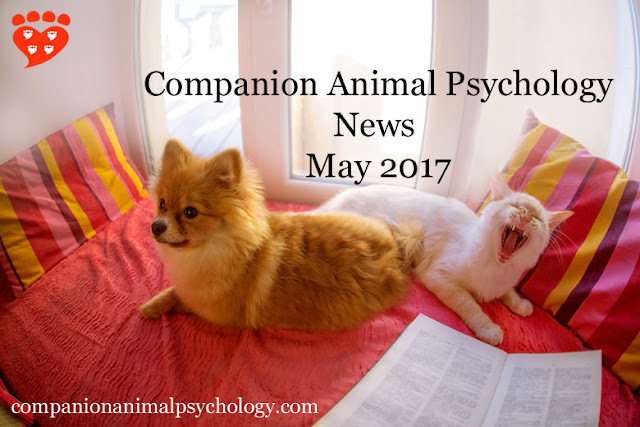 This month saw a thoughtful guest post from Kristi Benson on the ways dogs are like us and not like us. Thank you, Kristi! My post on a new study that found people mistakenly think anxious dogs are relaxed in interactions with babies hit a nerve and is already my second-most popular post of all time. I also wrote about the potential causes of problems in pet store puppies. I’m taking a week off blogging to catch up on other things. See you soon!